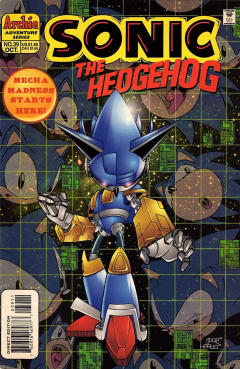 Sonic the Hedgehog 39 is the thirty-ninth issue of the Sonic the Hedgehog comic. This comic features one story: "Rage Against the Machine". The Freedom Fighters are holding a council meeting in the Knothole Village council chamber. Sonic has presented an idea to the council, consisting of Sally, Rotor, Bunnie Rabbot, and Antoine, but they have rejected his idea. Sonic starts a spindash in protest, claiming his plan is perfect. Sally, following the democratic style of the council, keeps up the decision, forcing Sonic to further prove that his plan will work. He recalls the plan, which involves him going to Robotropolis and getting captured and roboticized. Using one of Rotor's neuro-overriders, he'll have more power in a robotic body and trash the city and Robotnik. Rotor objects, recalling the time they did the exact same thing with Sally, which failed. Despite the earlier failure, Sonic feels that he can get the job done, causing Bunnie to interrupt, as, being partly roboticized, she understands what Sonic could go through. Despite Sonic's continuing protests, Sally enforces the council's decision, causing Sonic to exit the chamber in a huff. His actions make Antoine suspicious, who recommends that Sonic be monitored. Sally is quick to respond, objecting to his idea as Sonic is a loyal member of their group. A nervous Antoine quickly accepts her decision. Wanting to get some of his anger out, Sonic heads out of Knothole and arrives at their new training facility. He enters the building, intent on blowing off some steam by lifting weights. As he walks in, a dumb-bell on a rope drops on him, knocking him out. Nack the Weasel enters the scene, standing over the unconscious Sonic, mentioning his ease of escaping the Knothole jail. He ties Sonic up with a rope, recalling the time where he had attempted to capture Sonic prior, only to get knocked out by Knuckles. Despite the age of the deal between Nack and Robotik to bring in Sonic, he decides to do good on his part. Fulfilling the old deal, Nack brings a still-unconscious Sonic to Robotnik's feet, demanding payment for his deed. Robotnik, however, ignores Nack, ordering Crabmeat to send Sonic straight to the roboticizer. Nack is quick to respond, grabbing Sonic and demanding his money. Crabmeat gets angered at Nack's lack of compliance, pleasing Robotnik. As Crabmeat is small, Nack doesn't take his tone seriously, but Robotnik has a plan up his sleeve. He presses a button on his robotic glove, causing Crabmeat to grow into a large form. It grabs Nack, who starts to freak out, while Robotnik backs out from the money deal, claiming that his reward will only be to escape alive. Crabmeat throws Nack clear out of Robotropolis, while Robotnik grabs Sonic and prepares him for roboticization. He places Sonic in a roboticization tube, pleased at his long-awaited victory. He presses a button on a nearby console, activating the roboticizer. The process goes exactly as planned, as Sonic is successfully roboticized. Robotnik proclaims with joy, the creation of the new Mecha Sonic, as it explodes out of the tube, something Robotnik has only hoped to do for quite some time. With his new robotic servant at his side, Robotnik gloats about his newest creation, noting that all the aspects of Sonic have been enhanced in his robotic form. This enhancement concerns Crabmeat, asking Robotnik if he can control it. Using his experience with roboticizing Sally earlier on, he perfected his roboticization technique, ensuring pure loyalty. He then asks Mecha Sonic to provide a demonstration of his power...disposing of the large Crabmeat with ease. Robotnik doesn't want to waste any time, ordering Mecha Sonic to head for Knothole and destroy it. Mecha Sonic obliges, leaving the room and flying off to the Great Forest. Bunnie Rabbot enters the scene, kicking Mecha Sonic aside with her strength. She orders Mecha Sonic to surrender, but it has no intentions of doing so. It launches itself at Bunnie, but, using her telescopic legs, she pushes herself up, causing Mecha Sonic to charge under her and slam into a tree. Mecha Sonic isn't finished, quickly recovering and punches Bunnie. She brings up a shield from her robotic arm, protecting her from the punch. The two continue to battle as the others watch, while Sally thanks Rotor for developing enhancements for Bunnie's robotic portions. As the battle goes on, Bunnie appears to be losing, so Sally tells NICOLE to begin phase 3; contacting "Agent T2". T2, or rather, Tails, sits in the control center in Knothole. He receives a call from Sally, who calls out a condition red. Tails is shocked at the order, quickly moving to the communications console. Using the large console, he contacts Knuckles for assistance. Sally thanks Tails for his help, who is glad that he is finally being treated as an adult. Despite his comment, Sally tells him to wash his hands and brush his teeth. Back in Robotropolis, Robotnik watches Mecha Sonic's progress in a recliner, noticing the arrival of Bunnie, while a SWATbot arrives with a can of oil. Robotnik realizes he can take out Bunnie by using a remote power booster to send a surge through Mecha Sonic. The SWATbot notes that such boosters are hard to build. However, the SWATbot consists of materials that can be used to make one, so Robotnik rips it apart to do so. He builds the booster and activates it, sending a power surge through Mecha Sonic that gives Bunnie a huge jolt of electricity. The jolt causes her to fall to the ground, while Rotor and Sally go over to help her up. Sally commends her work, telling Rotor to take her to the Knothole infirmary. Knothole, meanwhile, is the next target for Mecha Sonic. Bunnie, hearing this and despite her condition, forms her robotic hand into a laser cannon and flies out of Rotor's arms for round 2 with Mecha Sonic. Bunnie catches up to Mecha Sonic and fires a powerful pulse cannon burst at it. Despite it being her best shot, Mecha Sonic remains unscathed. It responds to the attack by firing a pulse cannon burst at Bunnie, taking her out and causing her to crash to the ground again. Rotor runs after her while Mecha Sonic continues its course for Knothole, causing Sally to call out Sonic as a traitor and leaving Antoine scared. In the control center, Knuckles arrives while Tails updates him on what has happened with Sonic. Although Knuckles is usually reluctant to get involved with anything off of his island, his past association with Sally changed his mind. Despite Sonic's new robotic form, Knuckles is ready to fight him. He steps on the launching platform in the command center, which propels him high into the sky. He intercepts Mecha Sonic and gives it a powerful uppercut. The battle begins, as Mecha Sonic responds by punching Knuckles. He recovers as they start to exchange blows, while the Freedom Fighters watch. Continued in Sonic & Knuckles: Mecha Madness. According to the calendar in the council chamber, this issue takes place in a January on Mobius. Nack the Weasel returns, last seen in Sonic Triple Trouble. Bunnie tells Mecha Sonic to surrender like the "Yankees at Chickamauga". Chickamauga was the location of a major American Civil War battle that resulted in a Confederate victory. She later mentions "the south shall rise again", further expressing her southern style. As of this issue, Bunnie has received numerous enhancements to her robotic limbs, including a shield, rocket propulsion and an energy cannon. Further enhancements occur later in the series. The drawing style of Bunnie, in association with her enhancements, has changed, as her height has increased from when she was first introduced, making her look more anatomically like a human in stature. This kind of style change is also applied to other characters such as Sally and Antoine.